Global pleasure is the overarching goal of this blog, and as a reminder, my definition is : that global pleasure is the sum of all the pleasures of all the living species worldwide, including humans and oysters. The last five posts have been about oysters as aphrodisiacs, but to me that is only interesting because oysters are one of the best sea-foods from every perspective: evocative, top protein, among the most provocative of all possible menu choices, and not least, oysters can be rightly considered a best choice for food aphrodisiac. Aphrodisiacs by definition heighten sexual activity, and while not everyone is turned on by the sight of a raw oyster on the menu, many are. The disclosed virgin rawness is a stimulant for almost everyone. While losing some nutritional value, cooked oysters in bisques or as grilled appetizers are also most rewarding. For the rationales on the above conclusion that oysters are aphrodisiacs, see the last few posts. From an ecological perspective, (this blog is all about facilitating ecological choices by consumers and producers) oysters are at risk of becoming extinct. Unlike many other sea foods that can be farmed with varying degrees of success, most oyster production relies on pumping in sea water from nearby oceanic sources. The ocean is acidifying. Oysters build their shells out of calcium carbonate, which dissolves in acidic waters. So oysters are threatened by the climate change that is expressed as ocean acidification. Is a future without oysters on the horizon? Unless enough consumers and producers make better ecological choices, that is likely. Net, to celebrate Valentine's Day with a memorable meal, I suggest a Mediterranean-style seafood dish for consumers who dwell in a Mediterranean climate, namely Santa Barbara, and a local wine produced by a wine-maker committed to sustainable production: Stolpman Sangiovese. The next series of posts will focus on local sustainable wine-making. Soak squid in milk for 1 to 5 hours.Strain squid, discard the milk. Heat 2 tablespoons olive oil in a large pot over medium heat. Stir in the garlic, onions, carrots, tomatoes, and diced fennel. Cook and stir till vegetables soften. Stir in tomato paste; cook 10 minutes. Pour in wine. Increase heat to high. When mixture comes to a boil, add chicken stock, parsley or cilantro, tarragon, thyme, bay leaves, peppercorns, and saffron. Return to a boil, then reduce heat to medium, and simmer until the liquid has reduced to 1 1/2 cups, about 15 minutes. Strain out the liquid, and discard the solids. Heat 2 tablespoons olive oil in a large pot over medium heat. Stir in garlic, and cook until fragrant, about 45 seconds. Add sun-dried tomatoes and fennel; cook for 2 minutes. Pour in the strained saffron broth and chopped thyme; increase heat to medium-high and bring to a boil. Place oysters on top of the fennel, cover, and cook for 1 minute. 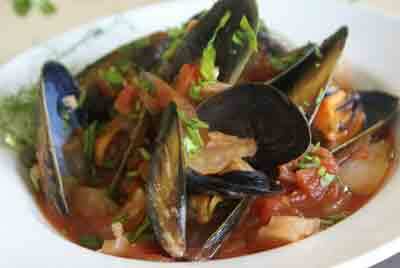 Set the mussels into the pot, cover, and cook until the shellfish begin to open, about 4 minutes. Stir in the drained squid, recover, and cook for 1 minute, just until the squid firms. While the shellfish are cooking, season the scallops with salt and pepper. Heat the remaining 2 tablespoons olive oil in a large skillet over medium-high heat. Whee the pan is hot, add the scallops. Cook over high heat until they develop an even, rich brown crust, 2 to 3 minutes maximum per sid, depending on size. As soon as the inside of the scallop is white not pinkish then immediately remove from heat and transfer the scallops to a plate. Pour the fennel-seafood mixture onto a serving platter and place the scallops on top. Garnish with parsley or cilantro sprigs. The next series of posts will be about ecologically sustainable restauarants in Santa Barbara County.